Sometimes it takes getting away to wake—and shake—us up. Maybe it’s getting away physically to a new setting; or perhaps it’s getting away from an old style or even escaping old ideas. In the case of Kinston, North Carolina, natives Eleanor and Charles Beasley, their petite Spring Island hideaway offers all of the above. She’s right about that. 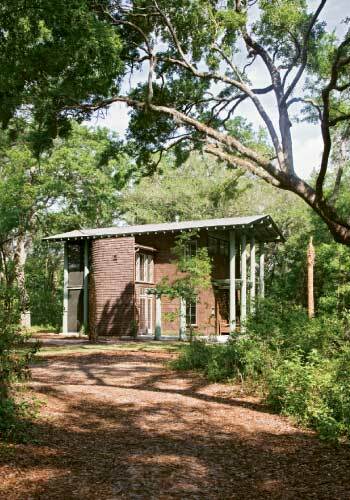 The dwelling, a diminutive but hard-working 1,260 square feet, is a two-story, two-bedroom, three-porch oasis on just over a dense, acre-and-a-half mix of live oaks, palmettos, palms, and wax myrtles. A natural-stained cedar shingle and pine-planked exterior allows the gabled home to blend into the landscape, while inside, fresh white shiplap walls, towering ceilings, and pocket doors amplify the blend of private and public spaces. As Eleanor points out, the shift between the wild outdoors and tame interior—apparent only when you step over the threshold—is striking. In the end, the place delivers just what the Beasleys craved. “We wanted something manageable and to feel like we were outdoors as much as possible,” says Charles, of the final mix of fresh-air living spaces and ample windows framing the lush landscape. “My favorite part is the upstairs porch and sitting room,” adds Eleanor. “It’s so peaceful up there. The sun sets on the tenth-hole pond, and it’s just like being in a tree house—a really, really comfortable tree house. 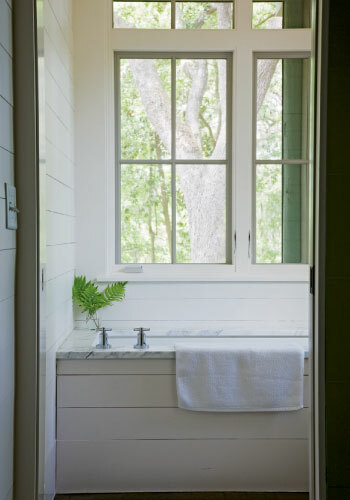 Architectural firm Thomas & Denzinger has the right idea about how to create a second home: design a simple, easy-care oasis. Here, a few of their tips and tricks for fashioning a getaway space that makes the most of limited square footage. Incorporate built-ins. 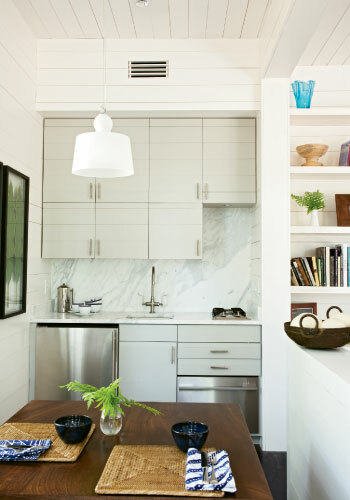 The dining alcove is tucked in across from the stovetop, where a fixed-to-the-floor wooden table is hugged by two benches to create an uncluttered unit. Create hidden storage. The dining benches and a section under the stairs double as secret storage space. Go vertical. Tall bookshelves and a sweeping, open stair lift the eye and make the ground floor seem voluminous. Open the floor plan. 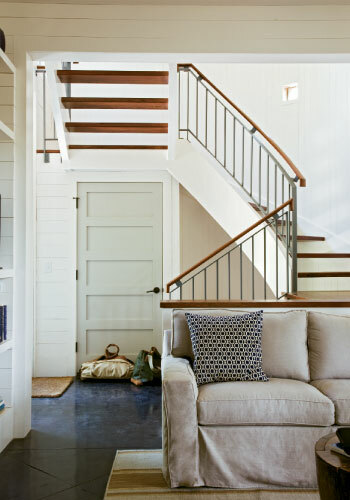 The first-floor common spaces are virtually undivided, and sitting areas open onto bedrooms, which open onto porches, creating an uninterrupted interior flow. Keep the base color palette simple. White amplifies space and reflects light, and thus it was used on all the walls and ceilings. 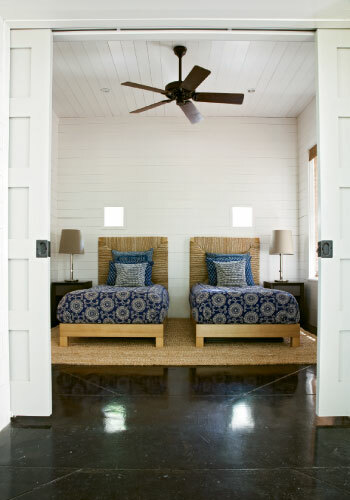 Throughout, dark floors anchor the rooms. 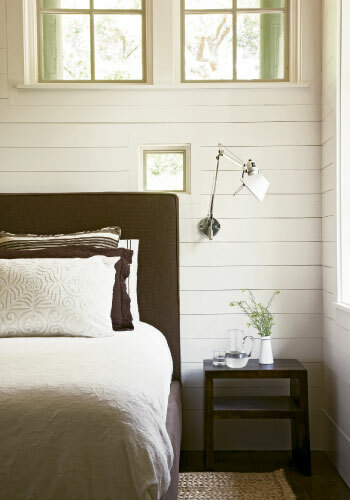 Pops of brown, white, and blue appear as accents in bed linens, rugs, and accessories. Live outside. 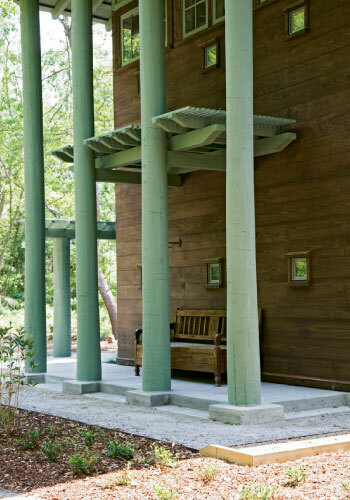 An outdoor porch downstairs became the “formal” dining room when a long teak table and chairs were added. mirror each other. Such clean design keeps a small floor plan uncluttered and open. Go easy on the patterns. The occasional stripe, the threading of Carrera marble veins, the lines of an old pine floor, and bedspreads in a batik-like design are the only patterns, which keeps things harmonious.